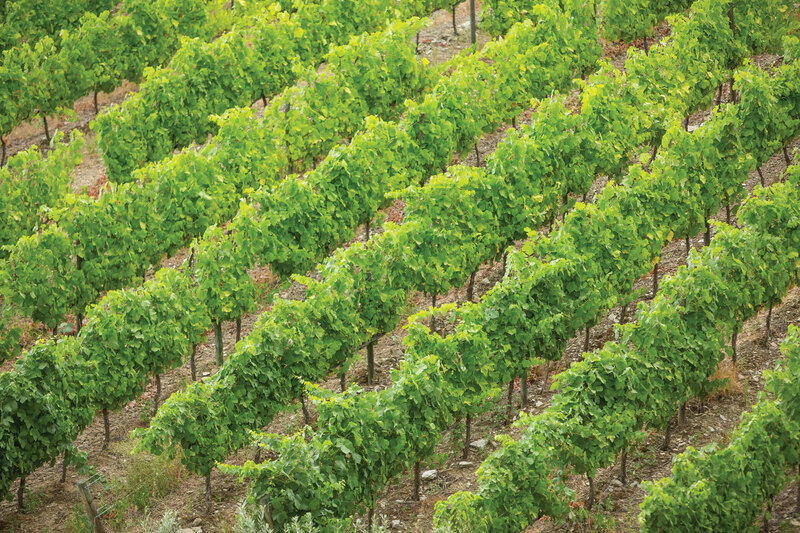 The Quinta possesses an extraordinary terroir, the unique interaction of microclimate, soil, aspect and numerous other characteristics, which at Vesuvio creates ideal conditions for the production of consistently superb wines. Located in the austere beauty of the eastern reaches of the Upper Douro valley, 120 kms east of Oporto and 45 from the Spanish border, Vesuvio commands a spectacular site on the south bank of the river Douro, between the Numão and Lavandeira castles. The topography is dominated by seven prominent hills with steep gradients, interspersed with winding valleys. Elevation ranges from 130 metres at the river front up to 530 metres. The continental climate is dry, with a low annual rainfall of just 400 mm on average, and characterised by seasonal extremes of heat and cold: summer temperatures as high as the 40ºs C and below freezing in winter. The soil’s main component is schist. The Vintage Ports made at Vesuvio stand alone amongst all the wines from the Douro. Year after year this vineyard produces incredibly rich and concentrated Ports with quite exceptional balance and length. The unique combination of location, soil, the varietal composition and traditional foot treading, result in the very special Ports of Vesuvio. The wines are uniformly excellent, with superb inky black-red colours when young, and the nose is always intense, with strong notes of violets and wild spring flowers. The taste is long, complex and rich, with layers of flavour that persist on the palate. Blueberry and blackcurrant flavours combine with rich bitter-chocolate to add structure to the Vesuvio Ports. Vesuvio Vintage Ports are seamless, with perfect integration and a velvet texture on the palate. Only Vintage Ports are produced – no other styles of Port are made under the Vesuvio name. The adega (winery) was built on an unprecedented scale and completed in 1827. There are 8 granite lagares, each of which holds 24 pipes of must and require 40 to 50 people to tread. The winemaking is traditional, and exclusively foot-trodden, the only modern concession being a stainless steel cooling system which helps to keep the must at an ideal temperature for fermentation, around 28º to 30ºC. Perhaps the Douro’s most famous quinta, besides its spectacular vineyard landscape, Vesuvio has a gracious house as well as a chapel, the adega and winery offices, and a dormitory for the harvest team. The property is exceptionally large: 325 hectares of which 136 are under vine; one-third of the vineyard is devoted to Touriga Nacional. When the Symingtons acquired the property in 1989 they began a programme of re-planting and new plantings, doubling the area under vine. Between the extraordinary variety of microclimates and the range of grape varieties grown on the estate, the Quinta is capable of making a great Vintage Port in all but the most challenging years. The entire property is A-rated, the highest possible quality designation. All grapes are picked by hand.